After having lost their first three home games this year fans probably began to wonder if 2018 may be the year when Rockford failed to dent the win column in the friendly confines of Ted Carlson Memorial Stadium. 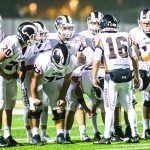 Those fears were put to rest in an emphatic manner on Friday, September 28th when the Rams put together their most complete effort of the season on their way to a 42-6 triumph over Caledonia. The win moved Rockford›s record to 3-3 on the season and left them at 2-1 in OK Red play. Rockford put 14 points on the board in each of the first three quarters to build a 42-0 lead. But the best score of the night was the final one for Rockford. 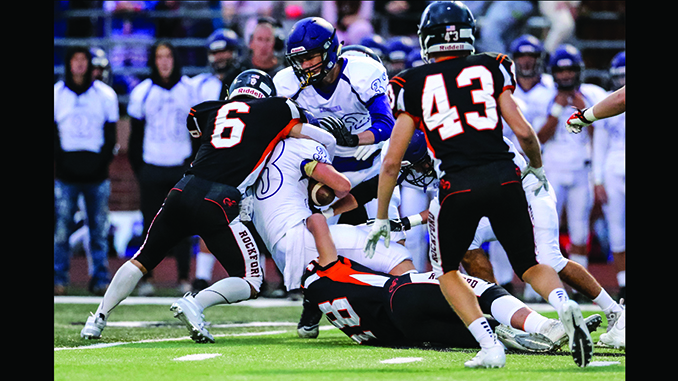 Already holding a 35-0 lead late in the third quarter and with the running clock rapidly eating up the balance of time, the Rams made it a night to remember for 6’1″ 260 pound defensive tackle Collin Herman. On the first play from scrimmage for Caledonia after forcing a rare Rockford punt at their own 31 the stars aligned perfectly for Herman. A shotgun snap was bobbled by the Fighting Scots QB and in his haste to recover the ball it was batted into the air. Herman was in the midst of barreling through the offensive line and somehow that batted ball landed directly in his arms while he was in full stride towards the end zone. Using the chance to demonstrate his running prowess, Herman darted untouched into the end zone from 26 yards out to make it a 41-0 game and set off a wild celebration with his defensive teammates. After fulfilling his duties on the point after team to make it 42-0 Rockford, another robust celebration ensued when he reached the Ram sideline. It was truly a defensive lineman’s dream and Herman made the most of it. 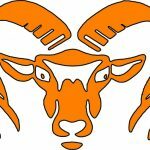 The first two Ram scores in the opening 12 minutes came on a pair of runs from junior fullback Jaiden Friesen, The first was a standard run for a fullback that covered a single yard at the 8:17 mark, but the latter of the two was a 39-yard burst right up the gut that came with only 28.2 seconds remaining in the opening quarter. Teagen Lenderink converted the first two of his six successful points after on the night after the two touchdowns. The second quarter scores came via a 3-yard TD run from Jack Richardson with 9:03 left in the half and a beautiful 25-yard TD pass from sophomore quarterback Chris Corey to Nate Bareno. Utilizing a fake pitch out, Corey rolled to the right before firing a pass in the left side of the end zone to the 6’6” Bareno. That left the score at 28-0 heading into the second half. Richardson got his second score on a twisting 19-yard run at the 8:28 point of quarter number three. That left Herman›s heroics to finsh out the night’s scoring for the Rams. The only points allowed on the night for the Rams came in heartbreaking fashion on the final play of the game. The running clock was nearly at the 0:00 mark and the Scots were lined up for what would be their final play of the night when the Rams lost what would have been their third shutout of the season. Utilizing a screen pass, the Scot receiver wound his way through the Rockford secondary before falling into the end zone with 1.3 seconds left to spoil the shutout for the Rams. 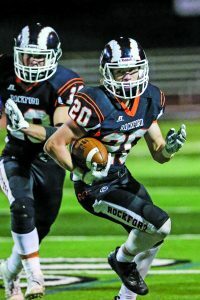 The Rockford defense and special teams had a big night as well with three fumbles recovered by Luke McLean, Dylan Dams and Herman. Dams also added an interception as the Rams won the turnover battle 4-1. Eli Haddad added a blocked field goal to the Ram cause that set up the Corey to Bareno TD pass. Ian Rodriguez led the Ram defense with 10 tackles while Alex Miller, Austin Klein and Cade Klimczak added five apiece. Corey was 6 of 9 passing for 81 yards and the lone touchdown. Friesen totaled 78 yards on nine carries while Richardson added 67 on his nine attempts. Bareno and Haddad each hauled in three passes to pace the receiving corps. Bareno’s catches netted 51 yards while Haddad’s accounted for 30. Rockford now begins a difficult three game stretch to conclude the regular season. First up is a road tilt against Hudsonville this Friday, October 5th. The Rams conclude the season at home against Grandville the following week before journeying to East Kentwood the final week of the regular season. 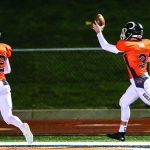 Kickoff is slated for 7:00 P.M. at Hudsonville this Friday as Rockford looks to end the season with a flurry.